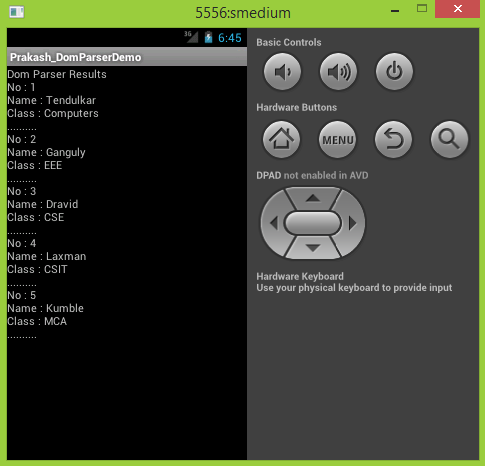 XML DOM Parsing in Android. The Document Object Model (DOM) is an API for valid HTML and well-formed XML documents. It defines the logical structure of documents and the way of documents accessed and manipulated. It is a hierarchy-based parser that creates the object model for an entire model. It is highly recommended for the small sized files or data because it store the data in memory. It is faster than the SAX parser. XML was created to structure, store and transport data. It will be easily readable by the humans as well machines. Follow the sample XML format. I am saving this data named studentDetails.xml in res/raw folder. Create a xml layout to display the DOM results. 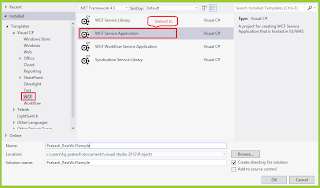 This tutorial explains you about the how to make HTTP requests to Rest-WCF/Web API service from C# MVC Client Application. HTTP is designed to enable communication between client and server. It works as a request-response between client and server. HTTP request methods are GET, HEAD, POST, PUT, DELETE, OPTIONS, TRACE and CONNECT. We use most commonly POST, GET, PUT and DELETE methods. These methods correspond to create, read, update and delete (CRUD) operations. The HTTP POST is most-often utilized for creation of new resources. It simply submits data into specified resource. I have created UserDetails model. The HTTP GET method is used to retrieve (or read) a representation of a resource. HTTP response codes- 200(OK), 404(NOT FOUND), 400(BAD REQUEST). HTTP PUT is most-often utilized for update capabilities, PUT-ing to a known resource URI with the request body containing the newly-updated representation of the original resource. HTTP DELETE is pretty easy to understand. It is used to delete a resource identified by a URI. 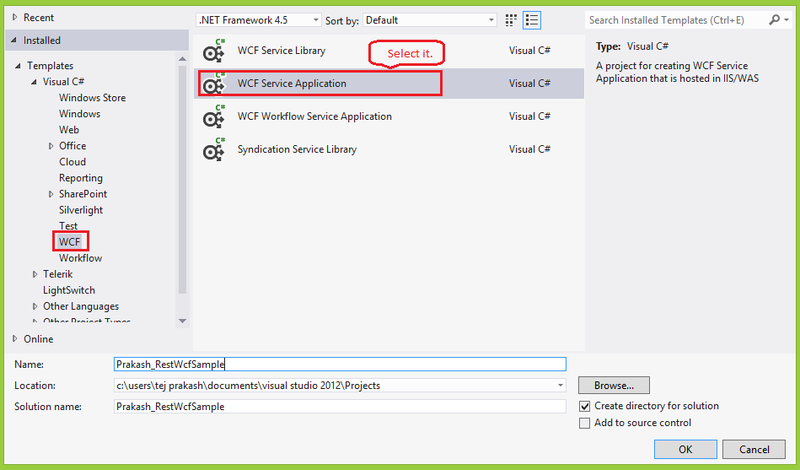 This process works fine for both REST WCF and WEB API services. This tutorial explains you about a Restful WCF service. Windows Communication Foundation (WCF) is a tool usually used to implement and deploy a service-oriented architecture (SOA).Clients can consume multiple services; services can be consumed by multiple clients. Services are loosely coupled to each other. WCF implements many advanced Web services (WS) standards such as WS-Addressing, WS-ReliableMessaging and WS-Security. With the release of .NET Framework 4.0, WCF also provides RSS Syndication Services, WS-Discovery, routing and better support for REST services. A WCF service communicates with the world through end point only. Endpoints remember like 'ABC'. Address (WHERE): It specifies about the service location. Clients will use the URL to communicate with the service. WCF supports transport schemas like HTTP, TCP, IPC, MSMQ and Peer Network. Binding (HOW): It specifies about communication type i.e. how client can connect with the service or using which protocols finds the services (SOAP, HTTP, TCP, MSMQ etc.). 1. BasicHttpBinding: Basic Web service communication. This is designed to expose a WCF service as a legacy ASMX web service, so that old clients can work with new services. When used by the client, this binding enables new WCF clients to work with old ASMX services. No security by default. 2. WsHttpBinding: It uses HTTP or HTTPS for transport, and is designed to offer a variety of features such as reliability, transactions, and security over the Internet. 3. WsDualHttpBinding: It is similar to the Ws Binding except it also support the duplex contract. 4. WsFederationHttpBinding: It supports federated security and transaction. 5. MsmqIntegrationBinding: It communicates directly with MSMQ application. It supports transaction. 6. NetMsmqBinding: This uses MSMQ for transport and is designed to offer support for disconnected queued calls. It supports transaction. 7. NetNamedPipeBinding/IPC binding: This uses named pipes as a transport for same-machine communication. This binding won't accept the outside calls. It supports duplex contract and transactions. 8. NetPeerTCPBinding: This uses peer networking as a transport. The peer network-enabled client and services all subscribe to the same grid and broadcast messages to it. It supports duplex contracts. 9. NetTcpBinding/Tcp Binding: Communication between WCF Service across computers. It supports duplex contracts, reliability and transaction. Contract (WHAT): It specifies the interface between client and server. It identifies what is exposed by the service. 1. ServiceContract: This attribute is used to define the interface. 2. OperationContract: This attribute is used to define the method inside the interface. 1. DataContract: This attribute is used to define the class. 2. DataMember: This attribute is used to define the properties. Message Contract: It allows the service to interact directly with messages. Message contracts can be typed or untyped, and are useful in interoperability cases and when there is an existing message format we have to comply with. Fault Contracts: It define which errors are raised by the service, and how the service handles and propagates errors to its clients. It is easy to find, what errors has occurred. Here, I have given info about Endpoints because it is very important for any WCF application. 1. Click on New Project. Then select WCF Service Application under WCF. By default, you will get 'Hello' method with BasicHttpBinding. Now, you have to do your own work here. The actual code starts from here. First, design your model by creating new class. We are using Data Contracts concept here. Have a look at below code. Then create a interface for the service i.e. give the operations which is operated by clients. Here, we are using Service Contract concept. It supports POST, GET, DELETE and PUT modes. Follow the below code. Now, do some required changes in WEB.CONFIG file for REST. Create a connection string to your DataBase. Then change the binding to webHttpBinding and declaring address, binding and contract. Follow the below code. Now, time to write service methods in PrakashSampleService.svc. I have used SQL Server STORED_PROCEDURES here. But, we can use LINQ queries also. First, declare a connection string. For help : your_service_url/help.You will find the all methods like below screen. 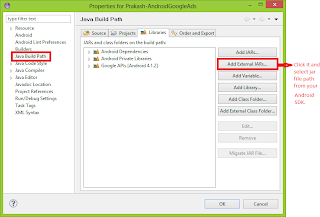 Admob Ads SDK Integration in Android. 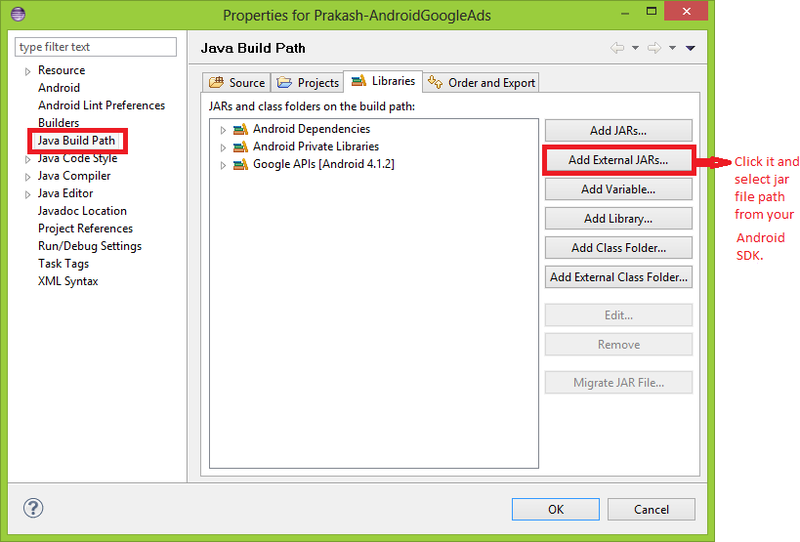 This tutorial explains you that how to add Google mobile ads to your application. AdMob provides you text, image banners and full screen ads. The following steps are required to get ads..
1. 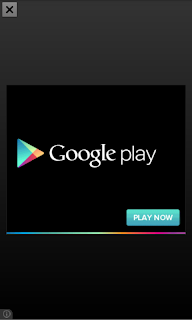 First, you should have a Google account. If have already, then login to AdMob site. 2. Add new app in AdMob site and get the Publisher ID. 3. Add AdMob SDK to your Android Apllication. How to get your Publisher ID from AdMob Site? 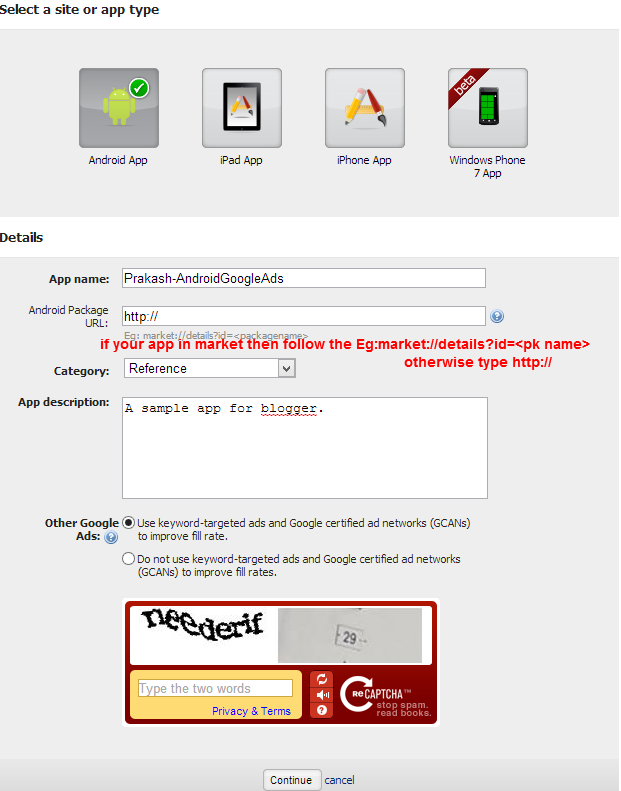 First, you should have a Google account to add new app in AdMob site. After logging, click on Sites & Apps and then select Add Site/App. Refer below pic. Then select your platform and fill the fields to complete the registration. Then Note down your Publisher ID from Manage settings. Copy your Publisher ID and paste it in your code. Add AdMob SDK to your Application. 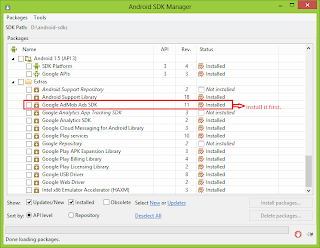 First, check your AdMob SDK library installation in Android SDK Manager. If not installed then install it. Open application properties. 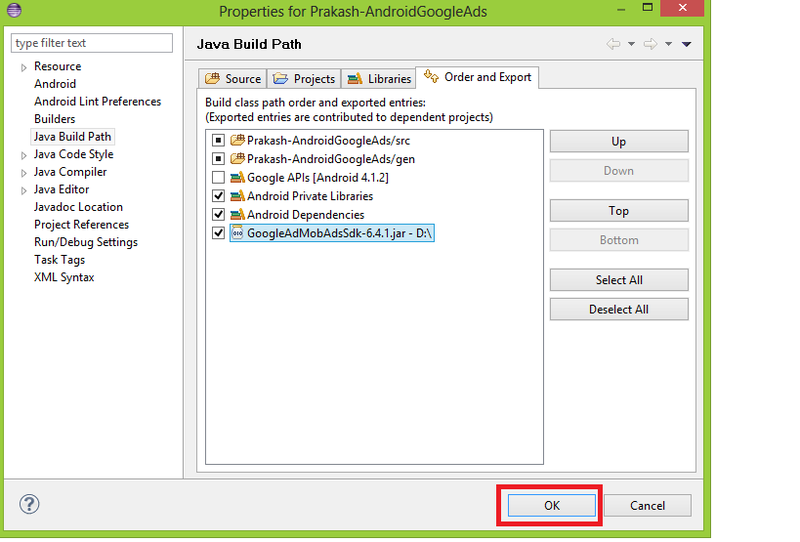 In JAVA Path, click Add External JAR. 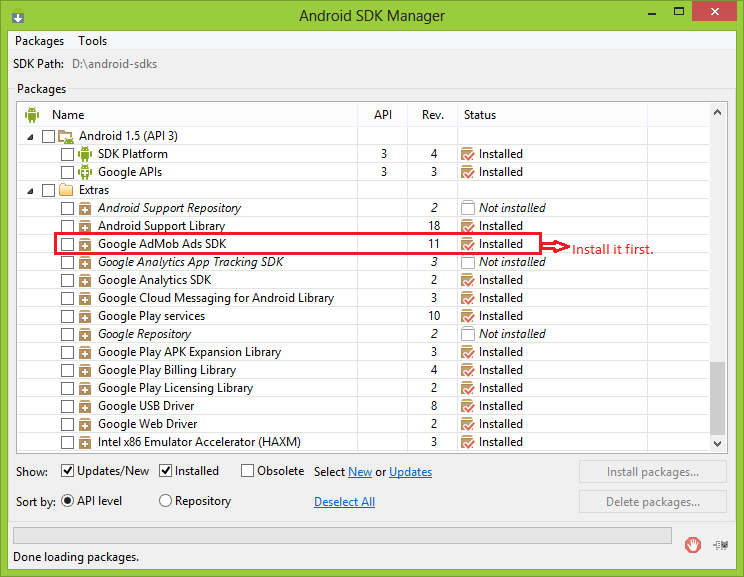 Get your AdMob JAR file from your Android SDK like D:\android-sdks\extras\google\admob_ads_sdk. After adding JAR file. 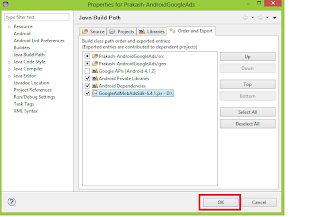 Select Order and export and check the GoogleAdsAdmobSDK JAR. Click OK to finish. Now, AdMob SDK added to your application. Add Internet and Access Network permissions in manifest file. Banner Ads used to display in small portion of screen. It available in different sizes for different devices. See table for available sizes. Either you can do it in Activity also. The banner output looks like below screen. Interstitials ads will displays in full screen. But banners will takes a small portion of screen. Interstials ads are richer and heavy weight. It mostly used in loading pages. // Change the button text and disable the button. * interstitial is shown, or an ad is clicked and launches a new Activity). 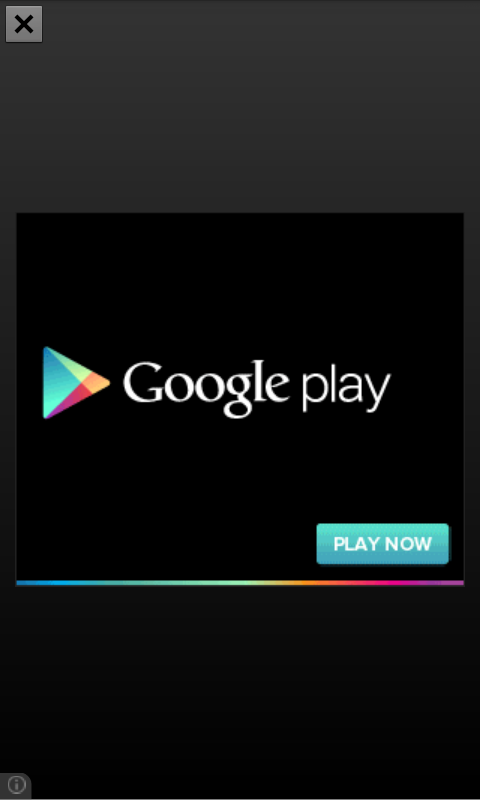 Note: Download samples from developers.google. 1.If you get Runtime Exception error, then check your JAR file version or make sure that your manifest file contains all the required details are correct. 2. Uncaught ReferenceError: AFMA_getSdkConstants is not defined : Ice Cream Sandwich won't allow network operations in Main thread. Load it in separate thread. Otherwise, check your network or internet connection once. Let's see about the Barcode Scanning in android. There are so many SDK's present today for Scanning barcode like Zxing, Red-scanner and Zbar. Both Zxing and Zbar are open sources. We can integrate it easily. Zbar is more fast and simple than Zxing. I inspired with the Zbar scanner. Here, we have a wonderful tutorial about the Zbar SDK integration in Android. Follow the link. 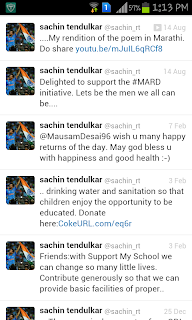 Get public tweets from twitter API in Android. Twitter provides you public tweets and simple authentication now. Twitter uses Client Credentials Grant flow of OAuth 2.0 specifications for their latest version. First, you should get your Consumer key and Consumer secret from Twitter Developer site. This both works as sensitive passwords for your application. 1. Encode the both consumer key and consumer secret into set of credentials. 2. Make an request to POST oauth2/token. On successful, you will receive bearer token. 3. 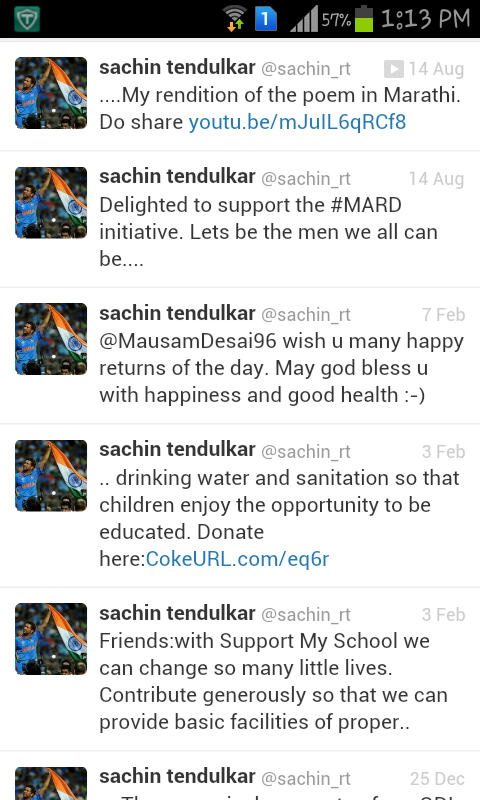 Attach screen name (twitterID) with your access token and get the data. // URL encoding of consumer key. // URL encoding of consumer secret. //Concatenate the both strings with colon ':'. Authorization: Basic " place here base64encoded string"
The request must be in HTTP post and Authorization header contains value of "Basic Base64 encoder string". There will be space between the Basic and base64 encoder string. The Content -Type contains value like "application/x-www-form-urlencoded;charset=UTF-8" and grant_type should have value like "client_credentials". //Use Http post to send request. //Append twitter api url here. //Append EncodedString to Authorization Header. On valid process, you will receive Access token here. The bearer token may be used to issue requests to API endpoints which support application-only auth. The request includes the normal Https and Authorization header value contains like "Bearer space bearer-token" . Without twitter signing you can get the data. //Receive response here and make it . 1.ASP.NET Web API Template: ASP.NET Web API is a framework for building web APIs on top of the .NET Framework.HTTP is not just for serving up web pages. It is also a powerful platform for building APIs that expose services and data. HTTP is simple, flexible, and ubiquitous. WEB-API 2 is available in MVC5. 2.Asp.Net Identity: ASP.NET Identity is the new membership system for building ASP.NET web applications. ASP.NET Identity allows you to add login features to your application and makes it easy to customize data about the logged in user. 3.Bootstrap in the MVC 5 templates: Bootstrap makes you easy design. MVC 5 contains Bootstrap 3.0. 4.New feature to create an ASP.NET MVC 5 App with Facebook Signin. 5.New feature to create an ASP.NET MVC 5 App with Google OAuth2 and OpenID Signin. This tutorials explains you about Shake animation in android. Now you can validate the required fields with shake animation rather than set error and toast message. Add anim folder in Android resources. Then create a new XML file in anim named as shakeanim.xml. By default, it rotates only one cycle. If you want custom cycles then create a another xml file in anim folder named as cycles.xml. And change the android:interpolator in Shakeanim.xml.